Production begins for the Boeing 777X and this is where the major transformation is focused. Boeing embarks on new production techniques with the 777X that are major cost-cutters, if all goes well. The company experimented a few years ago with Fuselage Automated Upright Build, or FUAB. The system was developed and secretly tested in Anacortes (WA), 40 miles north of the Everett plant where the 777 Classic is assembled. 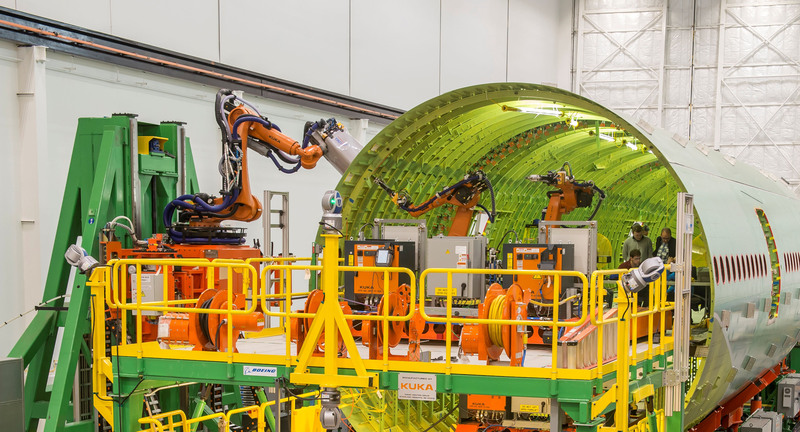 FUAB is a major leap in robotic production, drilling the tens of thousands of holes in the 777 fuselage through automation rather than touch labor. It’s faster, more accurate, safer and should reduce workman injuries and claims. Although The Seattle Times reported a fair amount of teething troubles as FUAB was implemented on the 777 Classic, the introduction on this airplane was intended to work through these issues and de-risk production application to the 777X. The 777X is also the first airplane for which Boeing produces composite wings. Those on the 787 were out-sourced. Boeing went through a very painful period with the industrial partner. As a result, officials decided to bring the wing back in-house for the 777X. Like FUAB, automation is the key at the wing factory. The first wing entered production in November 2016. The billion-dollar factory was built specifically for the 777X, but it has excess capacity. The 777X wing program lays the foundation for the wings for the NMA—and later, the New Small Airplane, the replacement for the 737. The deal by which Airbus agreed to buy 50.01% of the C Series program, followed by plans for Bombardier to build a Final Assembly Line (FAL) in Mobile (AL), next to Airbus’ A320 FAL, is already transforming the aerospace industry. In one move, Airbus filled the bottom end of the single aisle market that it was already losing. The A319neo has sold fewer than 60 aircraft and most of these probably will be up-gauged to the A320neo. For no money down—it paid only US$1 for the C Series interest and has no liabilities for the FAL construction or the first $700m in other costs—Airbus gained access to the latest in technology incorporated into the C Series. This will be useful when Airbus designs the next new airplane. The deal also denies the Chinese, who repeatedly sniffed around the program, access to the technology, no small consideration. Boeing predictably dismissed and dissed the Airbus-Bombardier deal. Weeks later, news emerged that Boeing and Embraer were engaged in merger talks. Embraer doesn’t bring the same level of product line to Boeing that C Series does to Airbus. The E195-E2 seats only 120 passengers in two-class configuration, below the redesigned Boeing 737-7 MAX’s 138. Ordinarily this would be a nice step-up, but the 7 MAX is a dead duck. Fewer than 70 have been sold, for reasons having nothing to do with the C Series. The 7 MAX’s original design had 126 passengers in two class. There have been 65 E195-E2 sales, with six fewer seats. The 737-7 in its original form and the redesign are sub-optimal aircraft. But 737 operators prefer the larger 737-8. Even launch customer of the 7 MAX, Southwest Airlines, appears to be moving away from the 7 MAX. It just deferred 23 of 30 orders for four years, ordering instead 40 8 MAXes. Just how many of these 23 Southwest ultimately takes now is a real question. The launch of the A321neo Plus, the NMA and consummation of the Airbus-Bombardier and Boeing-Embraer deals are events to watch for this year. Boeing’s 777X production gets underway this year. The success of its step-changes will be closely watched as well. “Transformations” is the watchword this year. Airfinance Journal adopted this as the theme of all its conferences this year, beginning with the 20th Annual Dublin event Jan. 23-25. I’ll be presenting on the topic of Transformations. The agenda may be found here. Separately, the Pacific Northwest Aerospace Alliance also adopted the theme, Managing Transformation, for its annual conference Feb. 12-14 in Lynnwood (WA). Information about this conference may be found here. Airfinance Journal and Leeham Co. have organized the first Southeast Aerospace and Defence Conference, which will be held June 25-27 in Mobile (AL). The theme: Building for the Future in an Era of Transformation. Information about this conference may be found here. We will see how durable and flexible both the A350-1000 and 777-9’s are. Both carry the risk that their Trent-XWB-97 and GE9X are not as dependable as the GE90-115B that do a mix of fairly short range and full range missions really well. Airbus knows the 35k PW1100G Engine is coming suitable for a A321neo+ or A322 but will CFMI produce a good 35k LEAP Engine for Airbus that will put pressure on the B797 program? The “Cat-and-Mouse” situation between the A322 and 797 is interesting. Won’t rule it out if AB launches an A321LR+ with modified wing (still CAT-C), slightly higher thrust engines, MTOW (~100T) and range. An 322 most likely a 15-20 seat stretch using the 321LR+ updates with 3500NM range. The 797 direct competitor could be An 322+ (323) with a new wing (CAT-D), Ultra-fans, 4500-5000Nm, etc.? It would be interesting if Leeham News did a parametric study of the A322 with new wingbox+ wing and different Max T-O thrust. My bet is that Airbus add one fuselage section before and one after the wingbox and use the optional boogie gear to lock the boogie gear pivot to rotate around the aft wheels to give tail clearance. Will be interesting to see who pulls the trigger first. I have seen drawings in an A32-series maintenance manual for 4 wheel bogies. Won’t be surprized if an airline such a Delta do conversions to an A322 with their 100 A321 options for example? Air India early on in the lifetime of the A320 for reduced runway loading. IMO, Boeing will go first, Airbus has a far quicker patch to upgrade. Airbus will fiddle with various A321 offerings until they see what they face. As with all predictions, it could be wrong. I see a “simple” update of the 321LR(+) as a priority for AB that should be launched at Paris for example and strengthen the 321’s dominance in its sector. Bjorn had a post about an A321 wing with split winglets (2% improvement), this with second generation PW1100G’s (35Klb? ), MTOW of 100T (+3T) could up the range to ~4400Nm (+300Nm) with “3.5 “aux tanks and ~180 pax? Maybe this is all that is needed in the short term for many airlines. The 322/323 potentially launched after the NMA. Could 2018 also be decision year for the A380’s future? Sure and also a pivotal point for the A330 Neo. 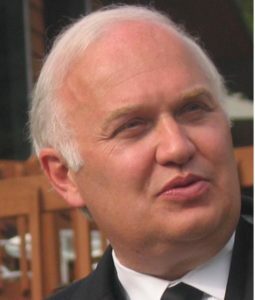 The A380 Emirates discussions is puzzling. If Airbus offers an A380+ with Emirates input they will not manufacture that version very long as Emirates seems to demand. As suitable Engines becomes available and Airbus can beat the 777-9 seat mile cost with >12-20% with an enhanced A380 they will switch production and terminate the A380-800 leaving Emirates with +100 old Aircrafts that are not competetive anymore on most routes. If Airbus could remanufacture old A380’s to A380neo’s with revised wing/pylons/engines/nacelles and aero/systems refinements for less than $190M/ea + D-check it could let Emirates switch fleet without being stuck with the old airframes and a too cramped DBX Airport. Keep in mind Emirate shot itself in the foot with the RR choice on the cu rent made A380s. So they have an abandoned fleet issue as well as two different engines for the same aircraft to deal with. RR shoots itself in the foot by offering an upgraded engine (or trying to) that they will not get return on. The RR engines muddied the waters for AB at EK with the 380? Was just thinking, what will Emirates be without the 380, a Ryanair flying 777’s? In 10-15 years from now airlines will need an A380-900 with the latest generations engines?! We heard exactly the same prediction/mkt justification per the above 10yrs ago when 380 sales began to slow down dramatically. Keep repeating the same prediction and it’ll become reality 1 day?! We’ve been over the crowded skies, airports, etc. Oil prices are difficult to predict but there will come a time when two deck (500+ seat) aircraft will be required. I don’t say keep the 380 alive in its current form, its really overweight and will be very outdated in 10+ years from now but AB should continue to do work on a replacement aircraft of the A380? In the US we call that doubling down, often a bad thing, you lost one round and now you throw in for two losses. Don’t get me wrong, I have seen the same thing with Alaska Airlines. At times they have 4 single aisles leaving for Anchorage (or going the other way) at the same time. You think, they should they get a 767? Somewhere in all that a guy in a rubber room is doing schedules and while there is a herd in those two, they split out and go different places on the Seattle end. There is something in the flexibility and frequency that works better if its withing range. That seems to drive to a a 777x/A350-1k or 787-10/a350-800 grouping in the long distance markets. No probs, Alaska seems to have its specific requirements/conditions. Many/most routes routes require there unique formula to make it “tick”. Not looking for trouble but see Alaska’s 1st A321 with typical livery in assembly. But to be blatantly honest, think a B757-200 (MAX) could have been better for your part of the world, fantastic no frills machine. I had not heard what the outcome of the RR was, it got covered up. When that happens you assume the worst, otherwise they would be a big PR event about how much more wondrous it was. Trying to be cute often winds up smacking you in the face. Proven? Do you mean in the specific case of a coastal desert environment? Don’t know what the consumption comparison is like, but on the maintenance side the IBA reported mid 2017 that first shop visit for GP7200s was averaging 2500 cycles, 27750 hours and $5.7-6.5mn, compared with 2900-3400 cycles, 27000-32000 hours and $6.5mn (unless upgrades added) for T900. Second shop visits are forecast at $6.8-8.0mn for GP7200 vs $6.2-7.5mn for T900. So, on fleet average and not dealing with unscheduleds T900 appears to have lower maintenance costs and longer intervals than GP7200. IBA also talk about GP7200s in harsh environments receiving first shop visit at just 3/4 of OEM suggested hours. So perhaps this skews the above figure and, if T900 can more closely meet suggested hours (I don’t know whether it can), may explain a maintenance advantage for T900 alongside the more general slower increase in consumption from being a 3 spool. Think EK should invest in dust control around Dubai’s airports? The GE9X with 134′” fans ground clearance could be tight for conditions? Will be interesting to get feedback from Qatar on the XWB84’s that’s been running a while on the 359’s. This brings me to the thought that airlines will eventually need a 500-800 seat double deck aircraft again. Could this culminate in an over wing aircraft that have freighter flexibility and options of four engines or two monster Ultra-fans. Never say never, cruise speed not a major issue (views will be great) as well limiting FOD damage and lowering the risk during landings in the case of landing gear problems. RR sometimes can support airlines alot. Norwegian (leasor) get new RR Trent 1000-TEN’s for all its 787-9’s in service, that will increase RR spares pool of regular Trent 1000’s but more airlines might ask for similar deals? My thinking is that Emirates can get a similar deal for RR Advance Engines if Airbus comes up with a A380 to A380neo program. Scott, thanks for this look ahead. It is a good summation, with an “on target” aviation theme for this year. But please help me a little on the Max7. I’m puzzled by the “lack of love”. Far be it for me to do BA’s marketing for them, but here are some immediate ideas that come to my mind: 1) 15 to 20 combis for Alaska for Alaskan operations; 2) another 15 to 20 Max7s for Alaska’s PacNW’s markets that can upscale from Horizon—SEA—MSO, and SEA—BIL come to mind (and maybe an hourly SEA—SLC shuttle, to stick it to DAL); a 20 to 25 subfleet for UA (again, DEN and ORD to MSO and BIL immediately come to mind); 3) UAflights from IAH and DEN to Dickinson/Bakken; 4) surely Ryanair could make a sub fleet work, and, possibly, Norwegian, in “fine tuning” their vast European ops; 5) combis in Africa (Eithiopean? ); 6) Aeroflot/S7 Siberian ops; 7) Smaller LATAM markets—Bolivia and Peru maybe? Is it just poor BA marketing, given these type market opportunities?Again, there seem to be plenty of niche markets for the Max7. Your thoughts? And maybe some later additions to a fleet here and there. This reminds me a bit of the situation with the A330-800. @Montery: Alaska decided to do away with Combis. The fundamental issue is that the original 737-7 design, which was simply reenenging the 737-700, was lipstick on a pig. The market had already decided the -700 was no longer desirable, preferring instead the larger -800. Even Southwest, the largest purchaser/user of the -700, swapped its remaining -700 orders for -800s years ago (and at Boeing’s urging, BTW). When the original 7 MAX design didn’t sell for the same reasons, plus the fact that it was economically inferior to the CS300, Boeing redesigned the 7 to be a straight-forward shrink of the 8. The 7 had been substantially different to the 8 to complicate production. Now, as a shrink, production is simplified, which is a good thing. But as a shrink, it is well known in the industry that shrinks are not as efficient as the model from which they are shrunk. The operating costs tend to be about the same as the larger airplane, which has more seats. Westjet, which has the second largest number of 7 MAXes on order after Southwest, swapped two orders to the 8 MAX and deferred others. Air Lease Corp ordered five or seven at the Paris Air Show. There is only one commitment that I’m aware of–10 from a Chinese carrier. This commitment does not show up as a firm order on Boeing’s website, though it certainly could be under Unidentified. If so, then there are 73-75 orders for the 7 MAX (including ALC). @Montery The MAX 7 now has the same wing and engines as MAX 8, so hot-and-high and short field (Midway, Burbank, Orange County) performance is better with the shorter fuselage than on the MAX 8. (I can’t speak to “appreciably better;” this is Bjorn’s field). The MAX 8 is a better freighter candidate than the MAX 7 (more cargo containers). That doesn’t mean the MAX 7 won’t someday become a P2F candidate. But–at 10 years old, the residual value (market value) is typically too high to make a viable P2F conversion. Planes typically need to be 20-25 years old for an attractive RV. Thanks so much! A happy and prosperous New Year to you both! Although airlines are downsizing requirements it appears that airlines prefer the larger models due to their potential better seat mile cost/revenue potential. There are actually many of these happening at the moment. The 321 is “gaining ground” on the 320. We could eventually see the 787-10 catching up on the 789 and 35K on the 359? Could be part of the 797 “predicament”. BA needs something around 220 -230 seats with 4500Nm range to compete with the 321 (X+). By the time it flies airlines may want something closer to 250-260 seats and 5000Nm range? If I must take off my Airbus cap BA should build a 757-200 capacity and range aircraft with MC21 cabin width and use the 777X building and materials concepts with ~40KLb ultra-fan engines. I think that the point of the NMA. Its not an A321 competitor, its bridges between a A321 and a 767 but with vastly lower base cost. While its notionally a 250 pax, its really capable of the 4500 plus or minus range with more like 275-300 maxed out. Missions I don’t see an A322 being able to do it can as well as cover A321 missions. You would not buy it just to be an A321 beater, you would buy it if you had a mission mix (or just beyond A321/22) and needed that. If my math is right, even at 2000 aircraft its a winner, if it goes to 3000 or better its a huge winner. I see the 250 pax as good, range maybe 5000Nm? BA could run into danger trying to sell it to airlines needing 321’s. Same as for AB trying to sell the 330-800 to airlines that need the 797. Only time will tell, for efficiency sake I hope its 2-4-2? Most likely will the A322 get a bigger carbon wing and wingbox than the present A321 and carry more fuel hence the A322 could get the A321ULR range with 4-5 more rows of pax. To use the CFRP optimal in the wing the span will increase. I am starting to have doubts about a (4500Nm) A322. It will be expensive to develop and have a limited market (757-300? ), running out of thrust with current engine options (MAX10-like). Planing and de-planing issues also start to to come into play with a stretch. Maybe AB should keep it simple with an A321LR+, updated wing, 100T MTOW, 35/36Klb engines, 4000-4500Nm, 200-180 pax. Updated wing to become standard on at least all 321’s? Rather use the money on a clean sheet aircraft somewhere between the “797” and 787-9 for EIS when Ultra-Fans will be available. After a good night sleep the NMA/MoM requirement actually very real. Can see the following “champion” aircraft. Don’t hope AB burns to much money on the 322, they are in real need of a clean sheet 250 seat aircraft (5500 range), 280 seat (4500Nm). The 3xx-NMA most likely a higher priority as it will compete with “797” and 787. MoM will be covered by a number of aircraft — the product space has become very apparent with the retirement of a couple of aircraft types and the MTOW gap is currently around 130T. If AB sweats it’s A32X architecture / component set to a reasonable limit — 105 to 110 MT MTOW — to gain 4M in length / 30 extra pax @ 32” pitch and another 500 NM range the MoM product space gets smaller but doesn’t close completely. All for the cost of a new wing that can be re-used on its smaller cousins, a bit of landing gear trickery and some help from the engine providers. OEW would be in the region of 55/56T with the inclusion of materials that are 30 years more high tech than the current wing. 35K thrust means 105T is on the agenda. 37K thrust in the near future means 110T is possible. Should keep the North German aircraft cluster going for a few more years. Anton, your last paragraph is my thought exactly. Two wing sizes so it can ultimately cover everything from A-320 to 757-300 capacity and offer various ranges for different missions. I think the twin aisle MOM may be something that ultimately won’t work/sell well enough to justify. Maybe in some years they can renew the 788 lighter and simpler for the top of the MOM mission. If Boeing is not going to do the 787-3, let alone the stand alone 787-8, lightening it up is not possible. And optimized 767 would be better without a new engine. You are’t going to cut 150,000 lbs off a 787, its an all new aircraft. A 767 with a new engine would be even better, but the associated costs would more than likely make the selling price too high and kill most sales. Boeing is caught by not wanting to make a 767Max, as that would make it too competitive to the 787. Same thing happened when the A321 first came out, Boeing was offering the larger 757 and the original 737-900, which it nobbled with less capacity and range so as to not take sales away from the 757. Once the 757 ended production after 9/11, suddenly the longer range and higher capacity ( more emergency doors) 737-900ER appeared. I can see the same happening with the 777X, a -10 model wont be announced till the 747-8 is totally out of production. I have to disagree on the 767 eating at 787 sales. I think it has more to do with its too much for NMA weight and cargo wise. Closest to the 767 was the -8 and its not one that Boeing is going to cut anyone deal on. The -9 is relatively heavy compared to the 767. Its more the dynamics of a 250 pax x 4500 miles no cargo and the prices you can charge. The 767 is never going to be low cost. Theoretically Boeing should be able to do the A330-NEO thing (paid for tooling, mature production, base support with KC465 and the FedEx 767F orders) . So far that has not worked out and you can be sure they have factored that in. My thoughts are that the MoM product space will be defined by both size and range. Currently we have the A321neo LR out to 4000 NM @ 52 / 54T OEW based on a high volume component set / platform. Good for enough real estate to support 210/216 economy seats at 32” although full range would probably mean 20 less in a mixed cabin. We have the out of production B767 300ER good for 6000 NM approx @ 91T OEW based on a low volume component set without a current home and a low spec engine. Enough real estate for 275/280 economy seats at 32”. Again less in a mixed cabin would probably needed for the headline range. Consequently two data points for the MoM product space. What would 75T of OEW get you with today’s tech? 300 seats at 32” for a 5000 NM range? Return of the Super Sixty @ 58.5M? AB can maintain their dominance in the upper end of the single aisle market with the 321(LR), potential 321(LR)+ and speculated 322. With the 787’s and potential 797 BA will totally dominate the 220-280 seat twin-aisle market and is starting to make inroads in the 300-350 seat class with the 787-10. Guess AB is standing in front of a number of key decisions, especially on the twin-aisle front. Matters relating to the CS-series aircraft could result in AB largely focus on single aisles and developing the A350-family. AB is said to developing and 251T A339 to compete with the 789. This HGW option could in end proof to have more applications in a long range version of the current orphaned A330-800. Another option however is to offer an A339 with engines de-rated to 67KLb. An aircraft with MTOW of ~230T and ~5800Nm range could be more than sufficient for most airlines that will be interested in replacing 330-200/300’s. For longer range the 359 most likely the aircraft of choice. One has to compare Aircrafts made for high number of cycles 737/A320/757 and todays long range widebody aircrafts A330/787 and up. Using todays widebodies on short range flying (like Japanese domestic A330/787/747) is seldom efficient nor economical. That is why the 797 is so special if it can be the first widebody that can survive missions like an A321. a) If we look @ how AS replaced its 734Combi fleet. It wasn’t by 73G Combi but by converting 73G into pure freighter. And I strongly suspect AS will continue to convert more 73Gs into 73G freighters mostly for Alaska routes. b) For scheduled pax ops, FAA type cert rules hv became very very tough for any Combi types in recent decades due to enhanced fire+explosion protection for pax fm potentially hazardous cargo on the same deck. c) Mostly due to b), only 22 frames of 73G Combi hv ever been sold(20 already delivered)….a far cry fm the 734Combi sales history in the 80s/90s. If we look @ 73G Combi operator list today, 15 frames are for U.S.Navy ops and the rest fly within Africa or for corp charters….all outside FAA jurisdiction re Combi regulations. There’re 737NG x151 in AS fleet today. 73G represents only 7.3% in that fleet which used to represent a larger % a decade ago. If some AS routes can upgauge fm Horizon’s Q400 to Max7, why AS didn’t do the same earlier with 73G @ AS? And U hv completely forgot UA narrowbody fleet strategy went the opposite way re gauge size last yr by converting all 73G on order into 738+Max8. UA could hv chosen to convert @ least some 73Gs into Max7s but didn’t. Why? The type of mkt size which traditionally scream UA Express gauge size…. FR fleet has over 400 737NGs today. Only 1 frame is a 73G which FR has ever acquired and used mainly for corp charters…..that’s the kinda “sub fleet” size actually ‘working’ @ FR for the past 2+ decades. Most importantly, FR didn’t do network “fine tuning” and stuck with 738 for over 2 decades but suddenly has such need now just because Max7 need more sales? Norwegian is an even more hopeless prospect for Max7….it has never ordered/acquired any 73G nor 319Ceo. If 73G Combi sales history in Africa is a guide(Only 3 frames hv ever been sold), extremely poor prospect for Boeing to invest in Max7 Combi development. As for ET, focus of its fleet acquisition seems to be around far larger birds such as 787, 350 and 77F if U hv been watching the aggressive fleet growth of this carrier over the past 6~7yrs…. Agree these are the only realistic sales prospects for Max7. However, their aggregate demand for Max7 is tiny. As explained, dig deeper into most of these “opportunities” and it’s obvious how remote/barren they are. Worst of all, CS3 and 319Neo with @ least equal/similar capabilities+efficiency as Max7 are fighting in that same “niche markets”. KE is a perfect example: Despite being purely 737NG in narrowbody ops for decades and already bet on Max8, KE chose CS3 instead of Max7 for a subfleet to ‘fine-tune’ mostly its Korea-China network. Boeing moving forward to a more automated manufacturing approach. Boeings position relative to established manufacturing methodology would be interesting. “Fully upright” was afaiu introduced to get to grips with the “fully wobbly” 787 type barrel sections. The circle sectional approach we see ( rather nicely documented by “Die Maus” documentary ) on the A320 should be of more interest for an assembly that does not need to start with an unbroken tube section. Thanks, an eye-opener to see how much manual input. What really surprized me was the lack of PPE’s (gloves, protective spectacles, ear protection, etc.). Even here in the African bush we operate very differently in this regard. Germany is pretty strict in that regard _if a reasonable risk exists_. Obviously you can overdo PPE into dysfunctionality. A US thing afaics. Very true, PPE “rules” often unpractical and can result in unsafe situations. Pay attention that it is a 1999 video, I assume lots have happened since then with automation, tools and workers ergonomics and protection. Airbus HAM has the possibility to recuit automation experts from BMW, Mercedes and other German high tech companies that install their automation equipment at these car companies automated assembly lines. Boeing has an advantage that the whole fuselage of the 737 is made by one vendor in one place then mated to wings, tails, pylon and nacelles in Renton with installation of all wiring, tubing, components and insulation and panels on 4 moving lines. Boeing should have half the production time or less and have 63% of A320 production cost making up most of the difference in profit between Airbus and Boeing. The Boeing accountants are probably nervous that the 797 will end up being a 787-8 money drain and want to keep the 737 profits flowing as long as possible. Appreciated, some insight in bottle necks increasing production rates. Nothing beat hand stitch leather seats. Totally of topic and irrelevant, will make a plan to get on an TAP 330-900 at the first opportunity. It is true that some of the know-how from the 787 build process made it into the FAUB, but it is wrong to say that it was introduced to deal with wobbly barrel sections. While FAUB does utilize 787 experience getting robots both inside and outside the fuselage to line up precisely, it has nothing to do with the “fully wobbly”, as you put it, 787 barrel fuselage sections. “The upright part refers to the fact that some of the time the robots will be drilling and installed fasteners directly overhead, which makes no difference to the robots but which is very difficult for people. Come on, Scott! Nobody denies the Chinese ANY technology they want. Why do so many of their military aircraft look so similar to ours? They stole all my company’s intellectual property. Just saying…. Same for the Soviets. Everybody steals from poor US. If we gave them the F-35 design they would be sunk. China doesnt have any US designs , it gets its IP from Soviet Union/Russia either by license build or reverse engineering. Even the so called stealth fighter the twin engine J-20 owes more to a Mig fighter that never made it production. the 1.44 and some revised nose and intakes. I do want to correct the record. China did break into the F-35 computers and pulled a lot of stuff out. They run a major espionage hacking operation to steal designs. They buy US companies to get the IP. A while back there was a lot of discussion about France doing the same thing. The future of Alitalia could be concluded in the not to distant future and be a transformation event in the European airlines dynamics. To put it into perspective, ~115M pax travel trough Italie’s 8 busiest airports and ~85M through Dubai. I think to get a good deal with Embraer, it has to be more than you can help us, we are big and please let us buy & dismantle you. Brazilian politics have not invested in the industry for that & Embraer is doing doing better then ever before. Not the NMA but NSA is what Embraer would be interested to share with Embraer. If Boeing thinks they can just step & do what suits them best, they are on the wrong track. Embraer isn’t desperately waiting for Boeing at all, they are fine. Agree, EMB would be interested in the NSA. Maybe EMB could be BA’s fast track into an NSA while they working on the NMA. EMB will look at Boeings treatment of Douglas Long Beach and think twice. Maybe a new EMB/Boeing FAL in Florida next to EMB bizjet assembly lines is the solution for a new NSA that can be a Al-Li fuselage /carbon wing fly by wire A321-A322 size to put competition with Renton FAL’s and letting Seattle focus of the 797 widebody as the 727/757/767 MoM Aircraft. Unless the Scope changes Embraer as noted has a deficit of new aircraft to build. Fine now is a heartbeat away from a heart attack. The question is what will EMB do after the present Projects. The KC-390, The ERJ-E2 series, the JAS39E/F finish work. They could do biz jets from the E2 series and do a KC-390B with more modern Engines like the PW1135G, a new wing and more payload/range like a 35ton fighting vehicle like the Bradley, Puma, CV90 and similar. A bigger fuselage E3 series hits into B737 territory. A curved ball from EMB/BA could be the development of an 2-3 NSA in size between the E-195E2 and MAX8 or between a CS300/500, effectively MAX7/319 size? P&W could make a suitable 1xxxG engine available relatively quickly. What is this NSA going to be? A 5 abreast C-series clone ot a six abreast MC-21 clone. If the former, it willbe a crowded market, if the latter they should just make it an A-320 to 757 size aircraft to replace the max and cover the NMA range too. I won’t rule out to see both, EMB most likely involved with an 2-5 NSA? The single aisle market is “huge”. BA is likely to have 3 air frames in a significantly smaller twin-aisle market, so why not two single aisle air frames? IMU the reason BBD looked more to Airbus than Boeing. We’ve seen quite the range of “takeover for looting” here. usually acompanied by interesting payment by credit and transfer of dept to the bought up entitiy. After the looting step only dept remains of a once healthy entity. This is unacceptable. Ain’t that the truth, but if we expect it to be anything but about CEO and their golden cushions and stock shares etc we are sadly fooling ourselves. The days of a socially responsible company where the 3 pillars of success are equal is long gone. As a working grunt, I will say that we are not the least concerned about the fewer injuries thing, nor do we buy that Boeing cares. Its just the yadi yadi , the thing the think the thing thrown out. Its like, its -40 out, you should dress up warmly if you go out. Duh , really, who knew? Its a meaningless phrase. Its about automation and getting rid of workers. The reality is that with a union, work safety issues are not remotely a factor. In short if you work smart you don’t get injured. Stick your hand in the bending machine and press the buttons to cycle it and the hand is gone. If Boeing could loose 100 workers a year and not have the publicity they would be fine with that. Claims are a completely different game these days. Quite a lot of employees are praying for an accident so that they can make a life changing claim.I have had to point out to youngsters on several occasions that death would be an unacceptable exchange for the cash. Maybe American or United will take some MAX 7. Apples to apples, isn’t the MAX 7 about 150 passengers to the CS300 at 135? They’re not going to have the choice are they? Perhaps not a choice for the CSeries, which is unfortunate, but a choice for some MAX 7 versus MAX 8. With American and United, they are flying different size single aisles, so maybe more tailoring of size makes sense. Only if you need takeoff performance form a small runway. Not a lot of those. If the tariffs on the CS remains US airlines will most likely have to operate a mix of E-195-E2’s and 320’s/MAX8’s, airlines don’t have appetite for the 319NEO’s and MAX7’s. @Ted: Apples-to-apples, it’s 138 to 135 two-class. You cited Y class @31 inches (Southwest) to a two-class CS300. A one-class CS300 is 145-149 seats at the same configuration. I wonder whether they will deactivate one pair of the window exits on the MAX 7. That might get them two more seats! e.g. likely cost similar to carry the same pax load by operating a Max8 @ about 65% load factor or a Max7 @ about 75% load factor. If short on cash @ any given economic down cycle, AA/UA can sell and lease back a Max8 @ much much higher value than a Max7. At any given moment in the near future, Max8 operators possibly out-number Max7 operators by a factor of 20:1 or higher…..Max8 is simply a far more liquid asset than Max7 and Wallstreet which indirectly control major AA/UA CapEx always love liquidity. Very valid point/s on liquidity. Airlines have the flexibility to deploy MAX8 vs 7 and 320 vs 319 on longer thinner routes with lower density seating and still have fairly similar range and field performance as the smaller models. As mentioned, there are very little difference in sector costs between the compared models. When considering airport fees, there are only 2T difference in MTOW between the MAX8 and 7. The difference between the 320 (79T) and 319NEO’s is ~4.5T, not sure if AB offers a lower MTOW A320NEO that could impact on fees for aircraft doing mainly shorter flights and several flights a day? For non-US markets the differential in sector costs of an CS300 vs the smaller AB and BA single aisles makes it a competent alternative depending on fleet dynamics. Don’t want to touch on politics but Brexit “kicks-off” March 2019. Was just wondering if AB has a “plan-B” regarding the Broughton plant in Wales if things go “belly-up”? You mean,what happens if the UK declares war on France?You’re being over dramatic. Not that bad, but there was mentioned of restrictions of non-UK (EU) citizens working in the UK, that could impact AB’s non-UK employees at these facilities? Thanks. Don’t need an A350 wing supply issue. I don’t know Grubbie, I think the Broughton site is a bit small for FAL or the fuselage work…..
Maybe off topic but TAP’s apparent non-alignment with other of the European Legacy airlines is noticeable. Its Geographic position makes it ideal for Transatlantic to the US and South-America. Especially Brazil, SA’s highest populated and also Portugues speaking country, Lisbon could be the Hub between Brazil/SA and Europe. Of note is that Qatar has no direct flights between Doha and Lisbon whatever the reason/s may be. Was just wondering if we could see changes in 2018 as is immanent with Alitalia? Then there are also the Canary, Cape Verde, Azores and Madeira islands. Maybe under estimated in the airline business? See they have 321LR’s on order, guess for Transatlantic mostly? Was the first time I really look at TAP, their 330-900 orders now makes sense. Right aircraft for the job. Assuming a stretch and re-wing, it is not going to cost too much more compared to a clean sheet design, and if a new wing was able to offer enhancement to the existing A321 performance perhaps an A321(NWO) (new wing option) could make sense with parallel production a l la NEO? They were building the A320 with 4 axle bogies for India in parallel with the standard bogie so they have some experience to all on. The MoM gap is 130T in MTOW. And it is 2500 NM in range. The A322 with a fairwind will not make a big dent in those numbers. Consequently lots to aim for as the old stagers retire and 1) US carriers get nervous plus 2) Low Cost Carriers gets interested. Market size for medium haul “large” single aisle, <300? What can it do what an A321LR+ can't? From a marketing point could end up with an 789 vs 339 situation, new vs old perceptions? In my view it is cost/pax*mile over 39 000 flights with 10-15hrs utilization/day. Can an A322 do it with 240-300pax with a mix of routes up to 4500nm almost as reliable and cost efficient as todays A321? There is a risk of the 757-300 problems but that Aircraft and its Engines where of a much older generation, a bit narrower cabin and much more expensive to run than todays A321’s. Can you board and deplane from 2-4 doors simultaneously it helps. I can see an A322 as a stretch to accommodate ~220 pax with standard layout amenities (not ACF cabin), 4 exit doors (not 3), ~40m wingspan, MTOW around 103T, “comfortable” 4500NM range. Stretch also to increase LD3-45’s from 10 to 12 (?) so to that 4 can be used as aux tanks, 4 wheel bogeys, etc. This will most likely need ~36KLb engines, these changes will not be cheap. An 100T MTOW 321LR+ (4300Nm) with 35KLb engines with wing mods which will be lower risk and potentially better return on investment. Then the million $ ?. Will airlines prefer the 322 or a new twin-aisle with 230-250 seats, 40-45KLb ultra-fans, 4500-5000Nm range? Won’t be surprized if by EIS the orders for the “797” could be between 500-1000? The ACF cabin has 3 lavatories which is 60-80 pax per unit for the 321. On an 8 hour flight things can turn ugly after breakfast and/or hour before landing?! OEW is a huge driver in this game. Data point for a twin aisle aircraft with floor space for 275 32” x 18” economy seats is 91T with enough payload for a near 6K NM range. My thoughts are that a single aisle aircraft — Super Sixty sized — could do the job with an OEW of around 75T with space for 300 plus 32” x 18” seats. Range would be 5K NM but still a big player in the MoM product space. Use the A320 platform / architecture / component set plus some substantial engineering for an appropriately sized wing and wing box. High volume product in a low volume world. The last few days I have been panel beating the 321LR+/322 vs NMA in my head. Routes, markets, engines, range, etc…., and every day it changes. But if it doesn’t work may it isn’t, or back to the drawing board and keep it simple. This could be hair raising for most. But, the A321 and 787-9 are the two best selling and efficient in their classes. Maybe what airlines need is something in the middle of the two. So, the NMA/MoM maybe (321+789)/2, its interesting what you get. Start having the looks of an B767-300(ER) build with Al-Li fuselage and CFRP wing?! Think many airlines will be interested in a clean sheet aircraft build based on averages below (excluding the list price). I think that you should be looking at a 270 seat all economy, 2+2+2 seat configuration. The biggest issue is the engine. I suggest the use of the Trent 553, which was used for the A340-500 at 53,000 lbf (240 kN). Compared to the PW1100G to be used on the A321neo, it is 40cm wider and 50 cm longer, albeit 2,000 kg heavier. The engine is proven to manage long trips. The length of the airframe will be similar to the B757-300 and the engine will allow at least two stretches to say 300 and 330 passengers. Maybe this can be a project for Embraer to get into the larger airplane business. Don’t think its worth stretching the 321 by more than ~3.5m, this will give it a length of 48m and the same fuselage width/length ratio as the 350-1000 and about the same length as the 757-200. Factors include wetted area/pax, boarding and de-planing, rotation angle, PW engines ground clearance near limit?, etc. Assuming the PW1100G-JW’s thrust could be increased to 35KLb it will result in an MTOW of around 102T (also assuming new wing could make up for longer fuselage’s increase in drag)? Sure there must be “hundreds” of options and permutations in AB’s database. Boeing would be better off relaunching the 787-3 (or slightly shorter to match the seating capacity of 767-300) than launching all-new MoM plane with about 3,500 – 4,000 nmi of range because it is lighter than -8, 21st century technology, use the same gate as 767, communality with 787. Not sure if this 184 aircraft A320 order from China is new or an old one firmed up? An interesting article on Europe’s big 3 airlines. Alitalia’s new home may swing the balance? Also some interesting stuff of high speed rail vs airline transport. Could the 20 x 359 “order” from Turkish Airlines pick-up AA’s in-limbo order slots? Won’t be surprized if Turkish become an important 350-1000 customer if things stabilize in that part of the world? The 40 x 789 order had politics written all over it for me. Won’t be surprized if these (or at least some) ends up in some long-haul LCC subsidiary? Think the prize was so lucrative that there could be a sell and lease back option involved. Air France – easyJet offer for Alitalia. Maybe this could work? Don’t know where KLM, Joon, Transavia, Hop will fit in, but it could be an interesting Pizza.